Sustainable small ruminant breeding is helping Kenyan farmers cope with climate change (photo credit: Solomon Kilungu/CCAFS). Using participatory community approaches, the project aims to help farmers increase their small ruminant meat and milk production substantively and sustainably, thereby increasing their household incomes. 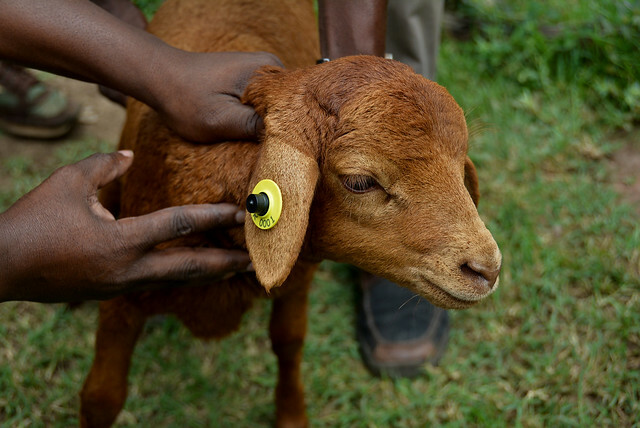 The small ruminants’ project for smallholder farming systems has been piloted in the Nyando climate-smart villages (CSVs) of western Kenya since 2014. Here, collective action in seven villages is helping smallholders integrate science approaches to address the effects of climate change and improve their food security. The science approach focuses on improving local knowledge of climate risks, of variability in seasonal rainfall and of diseases and pests. With participatory testing of resilience-focused crop and livestock technologies generated by CGIAR scientists, and with training to refine local practices and improve planning for changing environmental conditions, farmers can better respond to a more variable climate while also increasing their food and economic security. As part of this process, the project is hoping to develop and up-scale improved livestock breeding programs and strategies for use by farmers. ‘A lot of in-breeding between East African goats and sheep in the Nyando area has resulted in small animals that take long to mature and that fetch poor market prices’, said George Nandi, a livestock extension officer from Kenya’s Ministry of Agriculture, Livestock and Fisheries who works with the farmers in Nyando and the ILRI team. The project researchers are now introducing Galla goats and red Maasai sheep crossed with Dorper sheep. The researchers are also training farmers in improved animal husbandry practices and the importance of keeping good livestock breeding and related records. Compared to either pure local or exotic breeds, the sheep and goats crosses being introduced here are better able to withstand heat stress and to recover from drought, better able to utilize poor forage and cope with diseases, and are able to attain mature market weights within shorter periods of time. ‘The red Maasai sheep have longer tails, which we like, and they also resist diseases and parasites’, said Stephen Matinde, a Nyando farmer. Currently, 35 red Maasai rams are being used for breeding across the Nyando site. In 2011, ILRI successfully introduced improved red Maasai sheep, bred at ILRI’s Kapiti Ranch, in eastern Kenya, among pastoralists in Kajiado District, which experiences droughts and extreme weather events similar to Nyando. This introduction resulted in increased sheep raising among households in Isinya, Kajiado, and a new market for sheep milk in the district. ‘We’re already seeing improved growth from crosses of the introduced breeds and local animals’, says Ojango. The project is also focusing on improving ecosystem management and markets access for farmers in Nyando. Experiences from the Nyando climate-smart villages featured, last week, in a documentary series by the France 24 news channel. You can watch the documentary here (from 12:25 minutes). Also last week, some 3,000 scientists met in Paris ahead of the 21st Conference of Parties (COP21) of the United Nations Framework Convention on Climate Change (UNFCCC.) The Our Common Future under Climate Change Conference offered opportunities to discuss livestock breeding and other options for enabling smallholder farmers both to adapt to climate change and to mitigate its harmful effects. See related stories on the Nyando climate-smart villages project. Photo story: Responding to climate related risks to address food insecurity in Nyando, Kenya. CGIAR knowledge driving changing practices among rural farmers in East Africa (CGIAR website). Audho JO, Ojango NE, Oyieng, E, Okeyo AM and Ojango JMK. 2015. Milk from indigenous sheep breeds: An adaptation approach to climate change by women in Isinya, Kajiado County in Kenya. In: Animal Genetics Training Resource. Ojango JM, Malmfors B and Okeyo AM (eds). International Livestock Research Institute, Nairobi, Kenya, and Swedish University of Agricultural Sciences, Uppsala, Sweden. Tags: Galla goat, Julie Ojango, Nyando, Okeyo Mwai, red Maasai sheep. Bookmark the permalink. Cross breeds are more productive than the native breeds. But the native breeds are of better quality.